Land and water resources are essential for farming, grazing, forestry, wildlife, tourism, urban development, transport infrastructure, and other environmental functions. The increasing demand for land, coupled with a limitation in its supplies, is a major cause for more conflicts over land use throughout the world. Each type of land use has a varying effect on the hydrologic cycle , thereby affecting the people and the natural resources on a landscape. A watershed perspective can be used to scientifically study the effect of land uses on water and downstream ecosystems . A watershed is defined as a topographically delineated area drained by a stream system; that is, the total land area above some point on a stream or river that drains past that point. A watershed acts as a receiver, collector, and conveyer of precipitation on a landscape. Land uses affect these pathways by altering surface runoff and groundwater infiltration, thereby changing the quantity and quality of water resources. Natural vegetation, such as forest cover, is usually the most benign of land uses, with higher infiltration and reduced runoff rates. The opposites of forest cover are urbanized areas, where large surface areas are impermeable, and pipes and sewer networks augment the natural channels. The impervious surfaces in urban areas reduce infiltration and can reduce the recharge of groundwater. In addition, urban runoff contributes to poor water quality. Agricultural activities are major forms of land use, including row crops, rangelands, animal farms, aquaculture , and other agribusiness activities. Cropping activities involve soil and water manipulation through tillage and irrigation , thereby affecting runoff water and groundwater resources. If improperly used, fertilizer and plant protection chemicals in agricultural operations can affect water resources and ecosystems. Farmland continues to be lost to nonagricultural uses as population and development pressures increase. 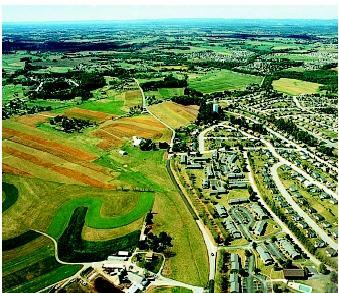 This cropland in Pennsylvania is being encroached by housing developments. Urban and agricultural land uses contribute to what is termed nonpointsource pollution in watersheds. Nonpoint-source pollution is defined as diffuse (spread-out) sources of contamination from a wide area of a landscape, often difficult to be attributed to a single location. Transportation infrastructure (e.g., roads and airports) is another type of land use that affects water resources through road runoff and alterations to components of the hydrologic cycle. Despite land-use impacts, land is required to support human and ecosystem needs. Urban areas promote economic growth and satisfy housing, industrial, and commercial needs of growing human populations. Agricultural land is critical to provide food and fiber to growing populations, and is an important source of employment in many countries. Forest areas provide raw materials for housing and the lumber industry, and are important habitats for wildlife. Wetlands and waterbodies cover land and are important in sustaining aquatic habitat and water supplies. Coastal fisheries, which are influenced by land-based activities, provide commercial and recreational opportunities. Thus, the basic needs of food, water, fuel, clothing, and shelter are met from the land, which increasingly is becoming limited in supply. As population and human aspirations increase, land becomes an increasingly scarce resource, calling for land-use planning. Land-use planning is important to mitigate the negative effects of land use and to enhance the efficient use of resources with minimal impact on future generations. Land-use planning can help coordinate various land uses in a watershed, thereby minimizing conflicts and sustaining water quantity and quality for future generations. This schematic represents typical land uses and conservation strategies that might be found in a coastal mountain watershed. required to select and adopt the best land-use options. The main objective of this planning process is to allocate land uses to meet the needs of people while safeguarding future resources. The planning process is iterative (cyclically repetitive) and continuous, and three goals are used to develop a plan: efficiency, equity, and sustainability. Efficiency in land use is achieved by matching different land use with areas that will yield the greatest benefit at the least cost. Equity in land use focuses on reducing inequalities in income, food security, and housing. Sustainable land use meets the needs of the present while conserving resources for future generations. Land-use planning aims at achieving a balance among these goals through the use of information on trade-offs, appropriate technology, and consensus-based decision-making. Effective land-use planning often involves local communities, scientific information on land resources, appropriate technologies, and integrated evaluation of resource use. Planning can be at various levels: local, town, district, state, regional, national, and international. A two-way link between these levels is important for successful planning. A "bottom-up" type of planning starts at the local level and links to the next higher level with active local participation. Local acceptability of the plan is a critical element of a successful plan. It is important that local people and stakeholders be involved in all steps of the planning process to make it a successful plan. This will also ensure local acceptability and effective use of local information. New ways of effective land-use planning include information management through GIS (geographic information systems), computer simulation, and spatial-temporal data modeling on present land use, alternative scenarios, and assessment of consequences. While zoning and regulation are the primary methods adopted by land-use planners, public education often is a neglected area that is increasingly being recognized. Other methods that planners use include economic incentives, institutional reform, and investment through multiagency cooperative projects. Land-use planning is becoming complex and multidisciplinary as planners face multiple problems that need to be addressed within a single planning framework. Such problems include nonpoint-source pollution, water allocation, urbanization, ecosystem deterioration, global warming, poverty and unemployment, deforestation, desertification, farmland deterioration, and low economic growth. Watershed-scale planning is gaining popularity among communities and agencies so that biological, physical, and socioeconomic components of the landscape system can be integrated into the planning framework. SEE ALSO Chemicals from Agriculture ; Floodplain Management ; Food Security ; Geospatial Technologies ; Land Use and Water Quality ; Planning and Management, Water Resources ; Pollution Sources: Point and Nonpoint ; Public Participation ; Wastewater Treatment and Management ; Wetlands . Brooks, Kenneth et al. 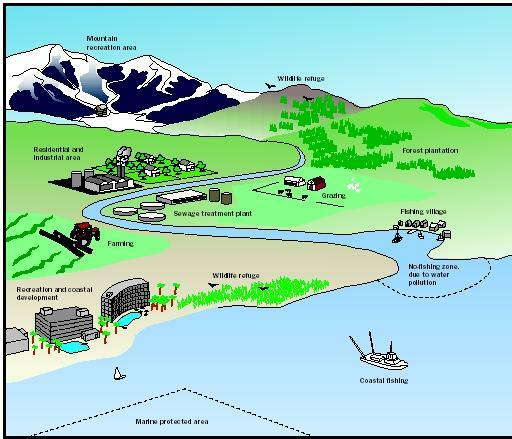 Hydrology and Management of Watersheds. Ames: Iowa State University Press, 1997. Food and Agriculture Organization. Guidelines for Land-Use Planning. FAO Development Series 1. Rome, Italy: Food and Agriculture Organization, 1993. Loganathan, D., D. Kibler, and T. Grizzard. "Urban Stormwater Management." In Water Resources Handbook, ed. Larry W. Mays. New York: McGraw-Hill, 1996. Geographic information systems (GIS) technology is an information system designed to work with data referenced by spatial or geographic coordinates. GIS technology is capable of assembling, storing, manipulating, and displaying spatially and geographically referenced information (e.g., data identified according to its location). Users also regard the total GIS as including operating personnel and the data that go into the system, as well as a set of operations for analyzing such data. GIS is an important aspect for helping government and commercial organizations manage natural resources more efficiently. GIS helps the water resource professional evaluate arrays or "layers" of information, and hence provides a tool for conducting tasks ranging from watershed planning to assessments of global climate change.